Drawing inspiration from a long line of cooking matriarchs, Rachel Vickers baked her first cheesecake at 11 years old, and it’s been her signature confection since. Last year, her delicious hobby became a full-fledged endeavor when she launched Rachel’s Delectables. After completing a class through the nonprofit small-business training organization Mountain Bizworks and setting up shop at the Blue Ridge Food Ventures shared-use kitchen in Candler, she’s been seeing sweet success with her newly minted business. Indeed Vickers’s passion includes blogging about her recipes and the history of the dessert in various cultures. Her first flavor test beyond the expected vanilla, pumpkin, and chocolate varieties was a goat cheese cake made with chévre from Looking Glass Creamery in Fairview. After mellowing the sharp cheese by adding lemon and just the right balance of sugar, Vickers was firmly ensconced in recipe development. 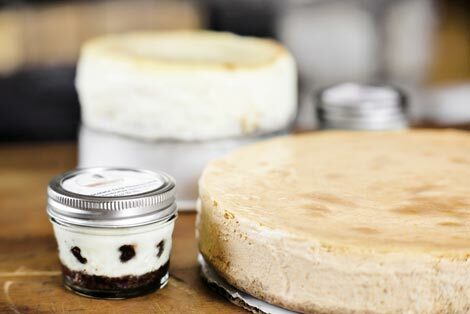 Another recent creation is the New Orleans goat cheese cake, an adaptation of two recipes, enhanced with lime zest and Grand Marnier and blended with goat cheese, cream cheese, and sour cream. As business takes off, Vickers, who also works as a paralegal, is finding more ways to excel. She offers special event and party services, including weddings, and to suit a wider variety of appetites, she’s developed gluten- and sugar-free recipes. Customers can purchase cakes from her online store, or find her at farmer’s markets in Buncombe County.